The letters mainly attest to the family�s standing in Lebanon from the beginning of the 19th century. Michel Chiha was born on the 8th of September 1891, the long awaited son after six daughters in succession. A further son and daughter would follow his arrival. Michel’s father Antoine passed away in 1903 having co-founded the Pharaon and Chiha Bank in 1876. In 1926 Michel married Marguerite Pharaon, the eldest daughter of Philippe Pharaon, Antoine’s partner in the bank. The marriage produced three girls, Micheline, Madeleine and Marie-Claire. 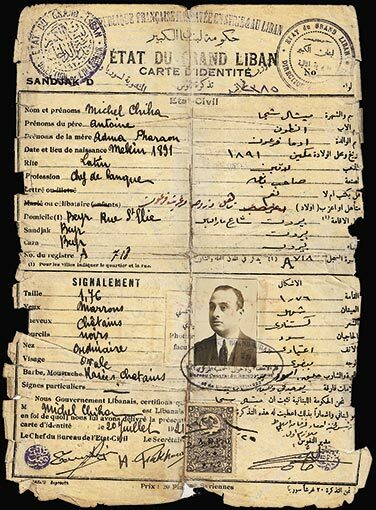 In 1906 Michel Chiha graduated from the Jesuit Université de St. Joseph of Beirut, having also managed to intersperse his studies with a great deal of travelling. Of a delicate disposition, his mother frequently went abroad for her health and often took young Michel with her, thus introducing him to Europe from a very young age. Indeed he often travelled to Europe, in particular to England where he spent some months at his uncle’s house in Manchester. As a result of the time he spent there, and in spite of a very strong French cultural background, he maintained a lifelong admiration for the English. …Forty years ago today we were sitting the University of Saint Joseph’s final exams. The memory dates us to a past era and yet in spite of the passing of time, it finds us true to form. Wasn’t it only yesterday and was that yesterday really forty years ago? There were only five of us ‘philosophers’, each one perfectly at home on their usual bench like a peaceful outing on an endless sea. In those halcyon days the senior classes were never oversubscribed and our philosophizing was more temperate than is expected of young students today. Do you agree Cardahi, fellow pupil and now Professor and eminent jurist? Is that not so fellow ‘philosopher’ Garelli, currently the solemn mainstay of the Ottoman Bank in Istanbul? In 1907, at the tender age of sixteen, he made his debut in the family bank alongside his maternal uncles after gaining some business experience in an English commercial firm.